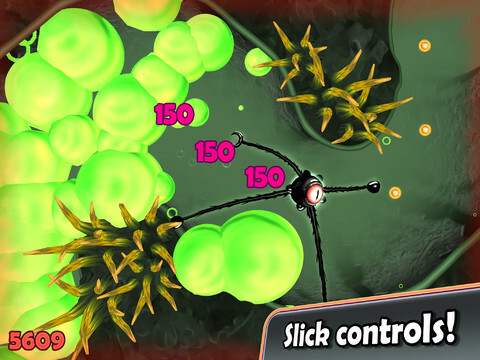 A Windows Phone classic creeps onto iPhone and iPad. Time to devour some eyeballs. 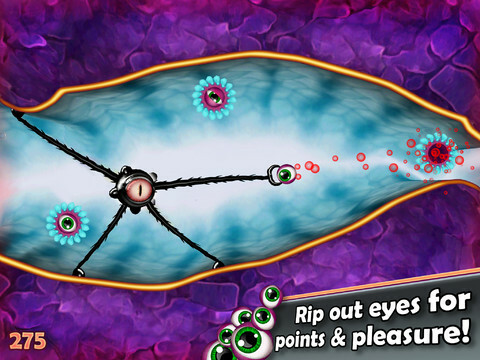 Tentacles was the jewel of Windows phone, a quirky video game that challenged players to guide a one-eyed creature through mad scientist professor Phluff's body while avoiding hazards and tearing out the eyeballs of the creatures within. Well, in a surprise move, Microsoft brought the game to iPhone and iPad, giving a whole new audience the opportunity experience Tentacles: Enter The Dolphin on Apple's smartphones and tablets. While not completely blown away, we still had a wonderful time frolicking inside the colon and other key areas, gobbling enemies with a satisfying crunch. On that note, the game casts you as Lemmy, a monster that uses its four tentacles to navigate inner space, a disgusting world teeming with life forms of all shapes and sizes, along with spikes, exploding puff balls and other dangerous things our hero should avoid. To move around, you simply tap a solid area and Lemmy immediately latches onto it. Before long, you'll quickly get the hang of the user-friendly controls, and speed through the doctor's (literally a dolphin with a human body) insides gathering collectible goodies en route to 40 level exits. Of course, the developers throw some wrenches into the experience, namely those aforementioned spikes, bosses and challenges that test your ability to not only avoid damage, but also complete stages within a time limit, highlighted by a depleting bar at the top of the screen. It's one thing to slowly make your way around, but picking up the pace presents difficulties, as you wrestle with momentum to ensure Lemmy's safety. To that end, those interested in 100 percent completion will likely return to different boards for gold stars. OK, so the game is fun, but what of the presentation? Somewhat humorous and disturbing 2D images make up the cut scenes, while professor Phluff's body is a feast of biological wonders, an alien world you'll enjoy exploring. At the same time, and as much as we like Tentacles: Enter The Dolphin, it left us wanting more, like online leaderboards for speed runs. That aside, the game definitely satisfies, especially if you spend another $0.99 for the Dog Eat Dog levels. Delightfully weird, you'll never look at a Petri dish the same way again, or lick one, for that matter. Yummy. What's Hot: Hostile alien world to explore, exquisite touch controls, eating eyeballs for days, 40 stages, Dog Eat Dog levels via in-app purchase, bizarre cut scenes, in-game achievements. What's Not: No Game Center support.